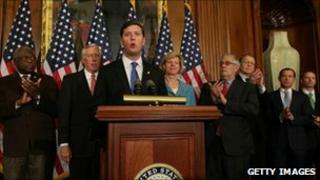 The US House of Representatives has voted to repeal a ban on openly gay men and women serving in the US military. The Democratic-led House voted 250-175, sending the bill, which is backed by President Barack Obama, to the Senate for approval. The vote comes a week after Senate Republicans blocked a similar measure to end the "don't ask, don't tell" policy, which came into force in 1993. The policy forbids gay soldiers from acknowledging their sexual orientation. The law is "the only law in the country that requires people to be dishonest or be fired if they choose to be honest", said Democratic Representative Jared Polis, of Colorado. Democrats who support repeal say they are committed to getting the 60 votes in the 100-member Senate needed to pass the legislation during the lame duck session of Congress, referring to the time between November's congressional elections and the January start of the new Congress. But Democrats face tough opposition from Republicans on the measure and an already busy agenda before the end of the year, including finishing work on legislation to finance the government and ratification of a nuclear arms treaty with Russia. A Senate aide told Reuters news agency that Democrats were "very confident" the measure would get at least 60 votes in the Senate. Roughly 13,000 men and women have been expelled from the military under the 17-year-old policy implemented under Democratic President Bill Clinton. Mr Obama has made repealing the policy a key part of his agenda since taking office in 2009. Earlier this month, the Pentagon released a report which found that allowing openly gay troops would have little, if any, impact on the readiness and cohesion of America's armed forces.